The original US CD-ROM Development Contract has been edited by solicitor in the UK to conform to English law specifically in the UK. The CD-ROM development contract is for use when creating CD-ROM, DVD or other mass produced presentations. Many web developers are now putting their clients PowerPoint, Web Site, Flash, Director and other Slideshow presentations on marketing CD-ROM's. This CD-ROM Development Agreement (UK) is included in editable Word format that can be customized in Word or by using the included Wizard software. THIS AGREEMENT is made this Current Day day of Current Month, Current Year ("Commencement Date") between Company Name Address City, State, Postal Code Country ("Developer") and Company Name, ("Client"), and collectively referred to as the "Parties. Whereas, Developer is in the business of offering Internet services relating to development of multimedia (Digital media graphic design, computer programming, web sites and CD-Rom presentations), and is willing to provide services to Client on the terms and subject to the conditions set forth below; and. Whereas Client desires to engage Developer, and Developer desires to be engaged by Client, to provide CD-Rom presentation services on the terms and subject to the conditions set forth below. "CD-Rom" means such of CD-Rom, DVD, PAL, video and any other media format to which the parties elect to apply this Agreement. 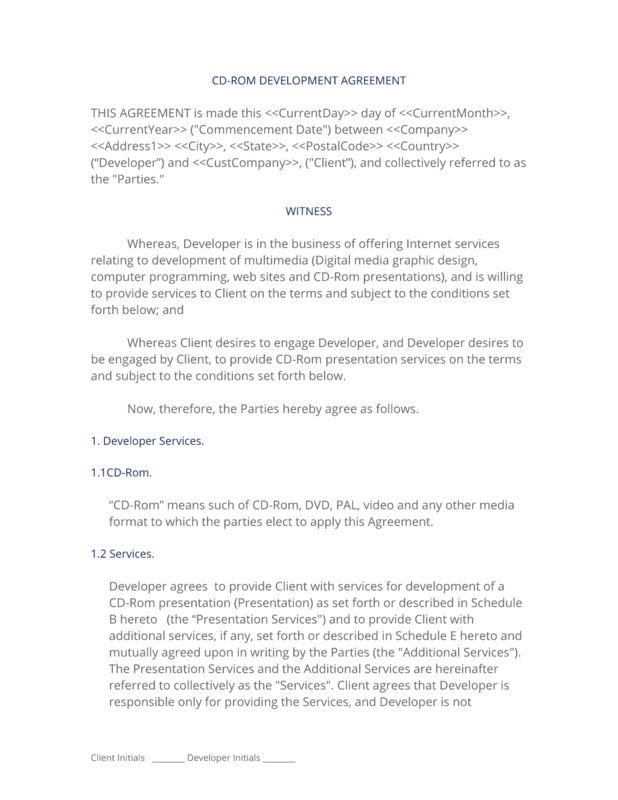 Developer agrees to provide Client with services for development of a CD-Rom presentation (Presentation) as set forth or described in Schedule B hereto (the "Presentation Services") and to provide Client with additional services, if any, set forth or described in Schedule E hereto and mutually agreed upon in writing by the Parties (the "Additional Services"). The Presentation Services and the Additional Services are hereinafter referred to collectively as the "Services". Client agrees that Developer is responsible only for providing the Services, and Developer is not responsible for providing any services or performing any tasks not specifically set forth in Schedule B or Schedule E hereto. Presentation Development and Transfer. Developer, in consultation with Client, shall prepare detailed written specifications for the Presentation (the "Specifications"). The Specifications shall consist of, among other things, a design for the Presentation, a flow chart of the pages for the Presentation, programming and interactive feature requirements, and the placement of any content or other materials which are to be incorporated into the Presentation. The Specifications shall be subject to any restrictions or limitations set forth in Schedule E or Schedule F. The Specifications which have been mutually agreed upon by the Parties in writing shall be attached hereto as Schedule E and Schedule F.
If the Parties are unable to agree in writing to mutually acceptable Specifications, after using good faith efforts, on or before 7 days after the Commencement Date, either party may terminate this Agreement by providing written notice to the other party. Such termination shall not relieve Client from the obligation of paying Developer for all fees due and owing to Developer as of the date of such termination. "Client Content" shall mean any materials provided by Client for incorporation in the Presentation, including, but not limited to, any images, photographs, illustrations, graphics, audio clips, video clips or text. Client shall deliver the Client Content to Developer in an electronic file format specified and accessible by Developer (e.g., txt, gif) or as otherwise specified in the Specifications. Any services required to convert or input Client Content not set forth in the Specifications shall be charged as Additional Services. Client shall promptly deliver all Client Content to Developer as required by Developer. Upon Specifications being mutually agreed, and upon Developer's receipt of the Client Content and any fees called for in Schedule A hereto, Developer shall commence tasks associated with the development of the initial version of the Presentation ("Initial Version") and notify the Client of the URL (Uniform Resource Locator), if any, or other address of the Initial Version. If Client fails upon request or by the deadline set forth (if any ) in Schedule A, to make the payment of any fees set forth in Schedule A, Developer may (i) by written notice terminate this Agreement immediately, (ii) keep Client's deposit (if any) and apply it towards any losses incurred by the Developer (iii) discontinue all or any Services rendered by the Developer under this or any other Agreement up to that point in time, including disabling any tracking, hosting or other services, and removing al web-site resources (if any). Developer shall use combinations of technology as Developer, in consultation with the Client, deems appropriate to develop the Presentation. Client shall have 7 days, or such time as otherwise agreed by the Parties in writing, from the date of a written notice of completion of the Initial Version from Developer to review and request in writing from Developer revisions to the Initial Version. Upon receipt of such requests, Developer shall use commercially reasonable efforts to implement such revision requests that are within the scope of, and consistent with, the Specifications. If Client wishes to implement any revisions to the Presentation that deviate in any material respect from the Specifications, Client shall submit to Developer a written change order containing (i) such revisions in detail and (ii) a request for a price quote for each change (collectively, the "Change Order"). Developer shall promptly evaluate the Change Order and submit to Client for its written acceptance a proposal for undertaking the applicable tasks and a price quote reflecting all associated fees associated with Client's Change Order. Client shall have 10 business days from receipt of such proposal to accept or reject Developer's proposal in writing. If Client accepts Developer's proposal to undertake the work necessitated by the Change Order, then the Change Order, as supplemented and/or modified by Developer's proposal, shall amend and become a part of the Specifications in Schedule E and Schedule F as appropriate and Schedule A hereto (Fee and Payment Schedule), and Developer shall proceed to implement such revisions in accordance with the Specifications and Schedule E and Schedule F as so modified. If Client has not made any requests for revisions (i) by the end of 7 days from the date of written notice of completion of the Initial Version from Developer, or by such time as otherwise agreed by the Parties in writing, or (ii) within 10 business days from receipt of the Developer's proposal contemplated in clause 2. then the Developer's proposal shall be deemed accepted by Client ("Acceptance"). A final proof will be provided to Client prior to mass production or replication and or release of the CD-Rom and identified to the Client as such. Client assumes full responsibility to make sure that the final proof is correct in all capacities, including, but not limited to: grammar, spelling, information, content, artwork, copyright and functionality. Developer shall not be held responsible for errors or omissions. Upon Acceptance of the Presentation or Developer's proposal (as the case requires) and payment of all fees called for in Schedule A hereto, Developer shall commence replication of the Presentation and endeavour to deliver to the Client an operational Presentation no later than 60 days after acceptance. Client must use Developer to replicate any additional Presentations produced on CD-Roms and may not replicate the Presentation on or through any other medium. Client may not replicate any of the multimedia or artwork owned by the Developer without the prior written permission of Developer. Client agrees that there may be differences between printed artwork and screen proofs of artwork, and artwork appearing on final mass duplicated CD-Roms replicated under clause 2. Client may not decompile, deconstruct or otherwise reverse engineer the Presentation, whether in whole or in part, without the Developer's prior approval. Developer shall only be responsible for maintaining backups, copies or other versions of any source or master files, whether developed by the Developer or not, for a period of one year from the date of this Agreement. Client agrees to hold the Developer harmless from any damage, loss of data, theft or other event that may occur to any photographs, source code, master or other digital files, digital media, print outs, documents or other Client Content given to Developer during the course of this Agreement. Client may arrange, in writing, for Developer to have copies to be maintained in escrow in the event Developer goes out of business, cannot maintain copies of source or master files, or as otherwise required by the Client. Subsequent to the execution of this Agreement by the Parties, in the event that Developer and Client agree that Developer is to perform additional tasks not in the original scope of Services hereunder, then the Parties shall execute a work order form (each an "Order Form") in the form attached hereto as Schedule F, at which time its terms shall be incorporated into and shall become a part of this Agreement and shall be subject to the terms and conditions hereof. As between Client and Developer, Client Content shall remain the sole and exclusive property of Client, including, without limitation, all copyrights, trademarks, patents, trade secrets, and any other proprietary rights. Nothing in this Agreement shall be construed to grant Developer any ownership right in, or license to, the Client Content, except as provided in Clause 3.2 of this Agreement. Subject to Client's ownership interest in Client Content, all materials, including, but not limited to, any computer software (in object code and source code form), script, programming code, data, information or HTML script developed or provided or created by Developer or its suppliers under this Agreement (with the exception of original elements of audiovisual displays created hereunder specifically for Client, which shall be deemed to be part of Client Content), and any trade secrets, know-how, methodologies and processes related to Developer's products or services, shall remain the sole and exclusive property of Developer or its suppliers, including without limitation, all copyrights, trademarks, patents, database rights, trade secrets, and any other proprietary rights inherent therein and appurtenant thereto (collectively "Developer Materials"). To the extent, if any, that ownership of the Developer Materials does not automatically vest in Developer by virtue of this Agreement or otherwise, Client hereby transfers and assigns to Developer all rights, title and interest which Client may have in and to the Developer Materials. Client acknowledges and agrees that Developer is in the business of designing and developing Presentations, and that Developer shall have the right to provide to third parties services which are the same or similar to the Services provided hereunder, and to use or otherwise exploit any Developer Materials in providing such services. Unless otherwise agreed to in writing by the Parties, Developer shall have the right to place proprietary notices and logos of Developer and its suppliers on the Developer Materials and on the Presentation, including developer attribution to Developer's Presentations. In no event may Client remove or alter any Developer proprietary notice from the Developer Materials or the Presentation without Developer's prior written consent. Client hereby grants to Developer a non-exclusive, worldwide, royalty-free licence to edit, modify, adapt, translate, schedule, publish, transmit, participate in the transfer of, reproduce, create derivative works from, distribute, perform, display, and otherwise use Client Content as necessary to render the Services to Client under this Agreement. Developer hereby grants to Client a limited, non-exclusive, worldwide, non-transferable, royalty free licence solely to make use of such of the Developer Materials which are incorporated in the Presentation and which are required for the operation of the Presentation. This licence does not include any source code forming part of the Developer Material. Developer hereby reserves for itself all rights in and to the Developer Materials not expressly granted to Client in the immediately foregoing sentence. In no event shall Client use any trademarks or service marks of Developer without Developer's prior written consent. Client assumes sole responsibility for: (a) the accuracy of materials provided to Developer, including, without limitation, Client Content, descriptive claims, warranties, guarantees, nature of business, and address where business is conducted; and (b) ensuring that the Client Content does not infringe or violate any right of any third party, including without limitation, intellectual property rights and does not violate any law. Client shall provide Client Content that does not contain any content or materials which are obscene, threatening, malicious, which infringe on or violate any applicable law or regulation or any proprietary, contract, moral, privacy or other third party right, or which otherwise expose Developer to civil or criminal liability. Any such materials provided by Client to Developer which do not satisfy the foregoing requirements in this clause 5.2 shall be deemed to be a material breach of this Agreement. In consideration for that portion of the Services to be rendered by Developer in connection with developing and finalizing the Specifications, Client shall pay to Developer, upon execution of this Agreement, the fees identified in Schedule A hereto under the heading "Specification Fees" (the "Specification Fees") unless otherwise agreed and set out in Schedule A. Upon Acceptance of the Specifications by Client, Developer and Client shall negotiate in good faith to agree on fees to be paid by Client for the balance of the Services. Such agreed-upon fees and associated payment schedules shall then be inserted in Schedule A hereto under the heading "Non-Specification Fees" (the "Non-Specification Fees"), and initialed and dated by authorized representatives of each of the Parties. Client shall pay the Non-Specification Fees in accordance with the applicable payment schedule set forth in Schedule A hereto. In the event Developer and Client are unable to agree on Non-Specification Fees following completion of the Specifications and after negotiating in good faith, either Party may terminate this Agreement upon 7 days prior written notice to the other Party. Client shall pay to Developer all fees not specifically itemised on Schedule A within 30 days of the date of the applicable Developer invoice. If Client fails to pay any fees within 7 days from the date due according to Schedule A, or within 30 days from the date of an invoice, where applicable, then (without prejudice to Developer's other rights and remedies) Developer reserves the right to charge interest on such sum on a day to day basis (as well after as before any judgment) from the date or last date for payment thereof to the date of actual payment (both dates inclusive) at the rate of 2% above the base rate of Royal Bank of Scotland plc (or such other London Clearing Bank as Developer may nominate) from time to time in force compounded quarterly. Such interest shall be paid on demand by Developer. In addition, failure of Client to fully pay any fees within 30 days after the applicable due date shall be deemed a material breach of this Agreement justifying suspension of the performance of the Services by Developer, and will be sufficient cause for immediate termination of this Agreement by Developer. Any such suspension does not relieve Client from paying past-due fees plus interest. Client shall be liable for any costs associated with such fee recovery, including, but not limited to, legal costs, court costs, and collection agency fees. Developer represents and warrants that (a) Developer has the power and authority to enter into and perform its obligations under this Agreement; (b) Developer's Services under this Agreement shall be performed with reasonable skill and care; (c) to the best of Developer's knowledge, the Developer Materials do not and will not infringe, or be misappropriations of, the property rights of third parties, provided, however, that Developer shall not be deemed to have breached such warranty to the extent that Client or its agent(s) have modified the Presentation in any manner or if the Presentation incorporates unauthorized third-party materials, through framing or otherwise; (d) the Presentation will conform to the Specifications (subject to the qualifications in this agreement). If the Presentation does not conform to the Specifications, Developer shall be responsible to correct the Presentation without unreasonable delay, at Developer's sole expense and without charge to Client, to bring the Presentation into conformance with the Specifications. Client waives its right to rely on any other warranty, express or implied. Client acknowledges that Developer is not responsible for the results obtained by the Client from the Presentation. Except for Client Content, Developer warrants that everything Developer delivers to Client on the Presentation and the tools used to create the Presentation are legally owned or licensed to the Developer. Developer is not responsible for fixing problems in the Presentation once Acceptance has occurred and replication has commenced. Any costs incurred by Developer in addressing such problems and re-application costs requested by Client in such circumstances, are the Client's responsibility. Client represents and warrants that (a) Client has the power and authority to enter into and perform its obligations under this Agreement, (b) Client Content does not and shall not contain any content materials, advertising or services that are inaccurate or that infringe or violate any applicable law, regulation or right of a third party, including, without limitation, export laws, or any proprietary, contract, moral, or privacy right or any other third party right, and that Client owns the Client Content or otherwise has the right to place the Client Content on the Presentation, and (c ) Client has obtained any authorizations necessary for hypertext links from the Presentation to other third party presentations. Except for the limited warranties set forth in Clause 7.1, Developer to the extent permitted by the law makes no warranties hereunder and Developer to the extent permitted by law expressly disclaims all other warranties, express or implied, including, without limitation, warranties of merchantability and fitness for a particular purpose. All Developer warranties expire 30 days after the services to which they relate have been delivered. Any externally linked services provided by Developer that the CD-Rom may require, including but not limited to tracking features, email hosting, forwarding, autoresponders, submission forms, expire 30 days from the date of this Agreement. External services related to CD-Roms and Presentations which are created by the Developer are not represented to be fully functional in areas requiring access to Internet services after 30 days from the date of this Agreement and may require an updated version to be created at extra cost which may include the cost of reduplication. The Developer is not liable at any time for any damages resulting from any third-party services the CD-Rom or Presentation may use, or changes made to externally linked services that are not provided directly by Developer. Developer will make every effort to test any third-party or externally linked resources that the Client requires, and will validate to the Client that all externally linked services are present and in working condition prior to signoff and replication. Developer is not responsible for maintaining any of the data, features or reports that third-party services may provide. Client agrees to indemnify, defend, and hold harmless Developer, its directors, officers, employees and agents, and defend any action brought against same with respect to any claim, demand, cause of action, debt or liability, including reasonable legal fees, to the extent that such action is based upon a claim that: (i) if true, would constitute a breach of any of Client's representations, warranties, or agreements hereunder; (ii) arises out of the negligence or wilful misconduct of Client; or (iii) any of the Client Content to be provided by Client hereunder or other material on the Presentation infringes or violates any rights of third parties, including, without limitation, rights of publicity, rights of privacy, patents, copyrights, trademarks, database rights, trade secrets and/or licences. This indemnity survives the termination or expiration of this Agreement. To the extent permitted by law, Client's liability will not exceed the amount actually paid by Client to the Developer under this Agreement. In claiming any indemnification hereunder, the Developer shall promptly provide the Client with written notice of any claim which the Developer believes falls within the scope of the foregoing paragraph. Client may, at its own expense, assist in the defense if it so chooses, provided that the Developer shall control such defense and all negotiations relative to the settlement of any such claim and further provided that any settlement intended to bind the Developer shall not be final without the Developer's written consent, which shall not be unreasonably withheld. Injury to Property or Person-Indemnity; Limitation of Liabilities. Subject to the terms of this Agreement, the Developer shall indemnify the Client and keep the Client fully and effectively indemnified against any loss of or damage to any property or injury to or the death of any person caused by any negligent act or omission or wilful misconduct of the Developer, its employees, agents or sub-contractors. The Client shall indemnify the Developer and keep the Developer fully and effectively indemnified against any loss of or damage to any property or injury to or death of any person caused by any negligent act or omission or wilful misconduct of the Client, its employees, agents or sub-contractors. Subject to the provisions of clause 7.4, Developer makes no representations or warranties whatsoever regarding hardware or software compatibility, "Y2K" issues, operating system compatibility and/or any and all improper use of the Presentation by an end-user, individual or other third-party. Notwithstanding anything else contained in this Agreement the Developer shall not be liable to the Client for loss of profits or contracts or other indirect or consequential loss whether arising from negligence or breach of contract or otherwise. The Developer shall not be liable to the Client for any loss arising out of any failure by the Client to keep full and up-to-date security copies of the Presentation computer programs and data it uses in accordance with best computing practice. Neither will the Developer be liable for any delay in delivery of the Presentation to the Client howsoever such delay may be caused. The provisions of this clause 9 survive the termination or expiration of this Agreement. This Agreement shall commence when signed by the Parties and thereafter shall remain in effect until the Developer delivers to the Client an operational Presentation in accordance with the Specifications in and milestones (if any) set out in Schedule E and Schedule F. Client acknowledges, however, that any delivery deadline, and the other payment milestones listed in Schedule E and Schedule F, are estimates, and are not required delivery dates. In relation to these dates time shall not be of the essence and the Client must make required payments as set out in Schedule A in any event. This Agreement may be terminated forthwith by either party on giving notice in writing to the other, if the other party shall have a receiver, liquidator or administrator appointed or shall pass a resolution for winding-up (otherwise than for the purpose of a bona fide scheme of solvent amalgamation or reconstruction), or a court of competent jurisdiction shall make an order to that effect or if the other party shall become subject to administration or shall enter into any voluntary arrangement with its creditors or shall cease or threaten to cease to carry on business, or in the case of an individual shall be adjudicated bankrupt. Any termination under sub-clause (1) shall discharge the parties from any liability for further performance of this Agreement and in the case of a termination by the Developer shall entitle the Developer to enter any of the Client's premises and recover any equipment and materials the property of the Developer (and to that end the Client hereby irrevocably licenses the Developer, its employees and agents to enter any such premises for that purpose) and also to be paid a reasonable sum for any work carried out by it prior to such termination and in the case of a termination by the Client shall entitle the Client to be repaid forthwith any sums previously paid under this Agreement (whether paid by way of a deposit or otherwise) and to recover from the Developer the amount of any direct loss or damage sustained or incurred by the Client as a consequence of such termination. Any termination of this Agreement (howsoever occasioned) shall not affect any accrued rights or liabilities of either party nor shall it affect the coming into force or the continuance in force of any provision hereof which is expressly or by implication intended to come into or continue in force on or after such termination. All notices which are required to be given hereunder shall be in writing and shall be sent to the address of the recipient set out in this Agreement or such other address as the recipient may designate by notice given in accordance with the provisions of this Clause. Any such notice may be delivered personally or by first class pre-paid letter or facsimile transmission and shall be deemed to have been served if by hand when delivered, if by post 48 hours after posting and if by facsimile transmission when despatched. Words importing the singular include the plural, words importing any gender include every gender and words importing persons include bodies corporate and unincorporate; and (in each case) vice versa;. Notwithstanding that the whole or any part of any provision of this Agreement may prove to be illegal or unenforceable, the other provisions of this Agreement and the remainder of the provision in question shall remain in full force and effect. Developer may use the name of and identify Client as a Developer client, in advertising, publicity, or similar materials distributed or displayed to prospective clients of Developer. Except for the payment of fees by Client, if the performance of any part of this Agreement by either party is prevented, hindered, delayed or otherwise made impracticable by reason of any flood, fire, judicial or governmental action, labour disputes, act of God or any other causes beyond the control of either party, that party shall be excused from such to the extent that it is prevented, hindered or delayed by such causes. Parties agree that all issues concerning Privacy Act compliance are for Client and Developer gives no warranty or undertaking that the Presentation complies with or operates in accordance with the requirements of that legislation and Regulations thereunder. A review for Privacy Act purposes can be obtained by Developer for an additional fee but will not be the subject of any warranty by Developer as to its accuracy. IN WITNESS WHEREOF, the Parties have caused this Agreement to be executed by their duly authorized representatives on. The complete CD-ROM Development Agreement (UK) - with the actual formatting and layout - is available in this Contract Pack.